This project is the perfect way to use up those old jeans you have collected over the years! 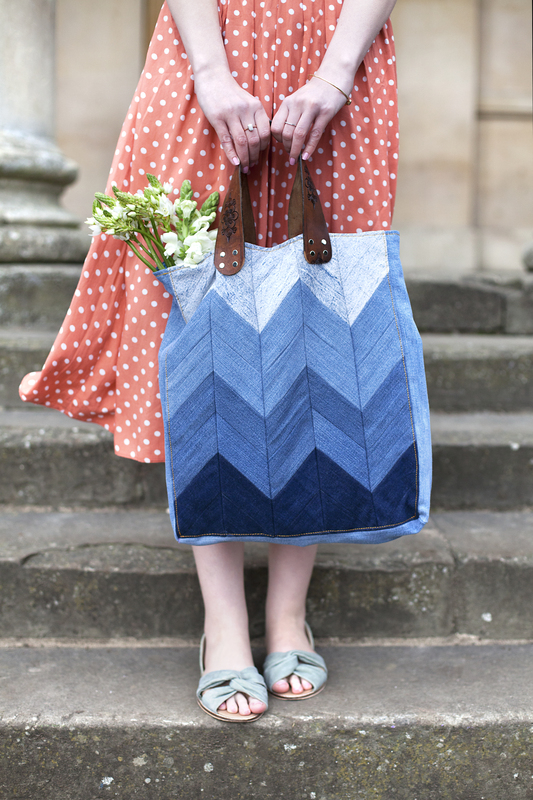 The re-purposed denim and belt handle in this project makes the bag super strong and sturdy. Use it for shopping, even the really heavy stuff! It also makes a great weekend break bag and the patch pockets inside are great for keeping essentials handy. 4-5 pairs old jeans – ones with wider legs are best. Avoid very stretchy denims and if possible it's best if they are all a similar weight of denim. The finished size of this bag is approx 16” x 13.5” x 2.5” but you could easily use the same process to make a bag to your preferred dimensions. Cutting out the strips is much easier if you have a quilting ruler and a sharp chalk marker like the Clover Chaco Liner that’s included in the pictures. For the front chevron panel you need to cut 10 strips measuring 2.5” x 18.5” and 10 strips measuring 2.5” x 13.5” for each side (I had 4 shades of denim so I cut 3 very dark strips, 2 dark strips, 2 medium strips and 3 light strips for each side in each size). Bear in mind that the first and last strip of the 10 will only be visible a little bit once the bag is finished. TOP TIP: Try to cut the strips out on the grain of the denim – use the hemline of the jeans as a guide. The grain is likely to be at a 90 degree angle to the hem. Cut the pockets off the back of the jeans for the internal patch pockets. To keep the original top stitching of the pockets, just cut the fabric as close to the pocket as you can. For the lining you will need 2 panels for the front/back measuring 17” x 14.5”, 2 panels measuring 3.5” x 17” for the side gusset and one measuring 14.5” x 3.5” for the bottom gusset. Cut the buckle off the belt and then cut the belt in half width ways to get the two straps. To make one of the chevron panels, take 10 of the longer strips and 10 of the shorter ones. Arrange them like a mirror image of each other, staggered by 1.5” from the top edge of each strip as shown in the diagram. With right sides together, sew them together using a ½” seam allowance and press the seam allowances open. On the sections that aren’t sewn, press them towards the wrong side of the fabric by ½”. From the panels you have just created, cut strips on the diagonal measuring 3 3/4” x 16 1/4”. You’ll have space for 3 on the larger panel and two from the smaller panel. Make sure that you have the corner of each strip on the second seam line down as shown in the picture. Line the 45 degree angle on the quilt ruler up with the seam lines to make sure the panels are cut out accurately across all the seams. Alternate the new strips from the two panels to create the chevron pattern. Starting from the top edge, sew the strips together with a ½” seam allowance making sure that the diagonal seam lines match up. You should be able to slightly stretch or bunch up the strips as needed to make sure the seam lines match. Press the seam allowances open. You may find you have an uneven edge at the bottom of the panel, this is quite common, and you can easily just trim it down to even it up. Repeat these steps to make the second panel. Cut 2 strips of interfacing 3” x 14.5” and iron it onto the top edge of the front and back bag panel. If you used lightweight fabric, you may want to interface the whole panel to give the bag more body. Sew the side gusset strips to the bottom gusset strip stopping ½” from either end. Sew the gusset to one front/back panel with right sides together using a ½” seam allowance. Do each side and the bottom edge as a separate line of stitching (i.e. don’t pivot at the corners like you might normally do). Stop ½” from the bottom, fold the gusset back, sew along with bottom edge of the bag. Press the seam allowances towards the front/back panel and using top stitch thread, stitch the seam allowances in place to the panel 1/8” from the seam line with the front of the bag facing you. This will help to frame the bag nicely. Continue on the bottom and other side, sewing them as separate lines of stitching as it will be too tricky to pivot at the corners. Sew the other panel onto the gusset in the same way – sewing each side separately and stopping ½” from the bottom. Top stitch the seam allowances to the front/back panel in the same way as you did before. It will be a bit trickier but just take it slowly. Sew the patch pockets from the jeans onto one of the front/back panels of the lining fabric with a little triangle at the top corners. This will make them stronger and help prevent the fabric form ripping. Position them to your preferences – just make sure they are at least a few inches from the edge. Construct the lining in the same way as you did for the outer bag but miss out the topstitching step. Then sew the lining to the outer bag around the top edge with the right sides together leaving a 5” gap along one of the edges so that you can turn it inside out. Turn the bag and lining the right way round, gently pushing it though the gap. Press the seam flat making sure that the lining is hidden inside the bag and at the gap, tuck the raw edges in then press and pin the gap closed. Top stitch all the way around the top of the bag with the outside of the bag facing you. This will also seal up the gap you left open. Using a leather hole punch, make 4 holes in the belt. I made mine ½” then 1” up from the bottom edge of the belt, but this may vary depending on the size of your belt/strap. The strap should overlap onto the bag by 1.5”. Make corresponding holes in the bag, again using the hole punch. Using the tubular rivets attach the strap onto your bag. Push the longer side of the rivet through the strap first, then though the bag. Then click on the smaller side of the rivet. Secure in place using a hammer and the little circular disc that comes with the rivets to protect the surface you are working on.